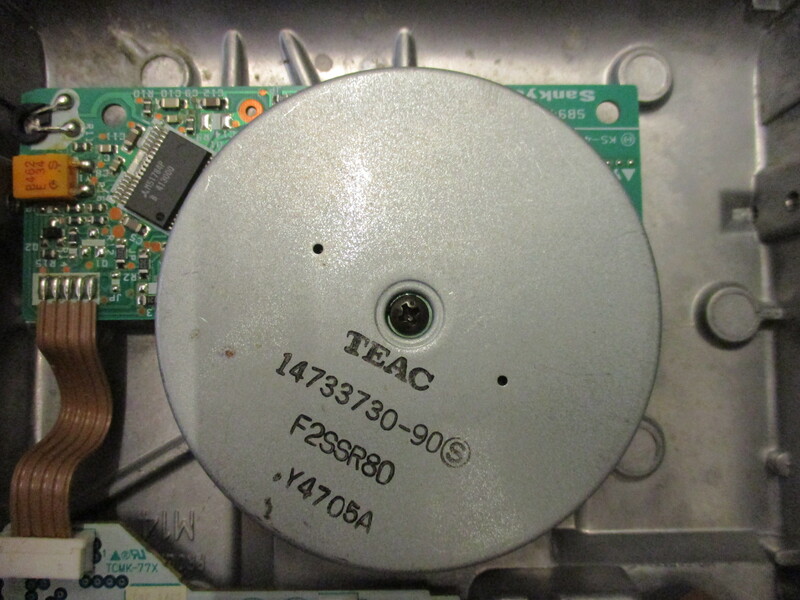 Our FC5025 controller connected to the TEAC FD-55GFR 5.25″ floppy disk drive. The new year and holidays brought with it gifts and offerings for our legacy digital project! Upon returning from our holiday break, we were greeted with the arrival of our TEAC FD-55GFR 5.25″ floppy disk drive along with Device Side Data’s FC5025 USB 5.25″ floppy controller. 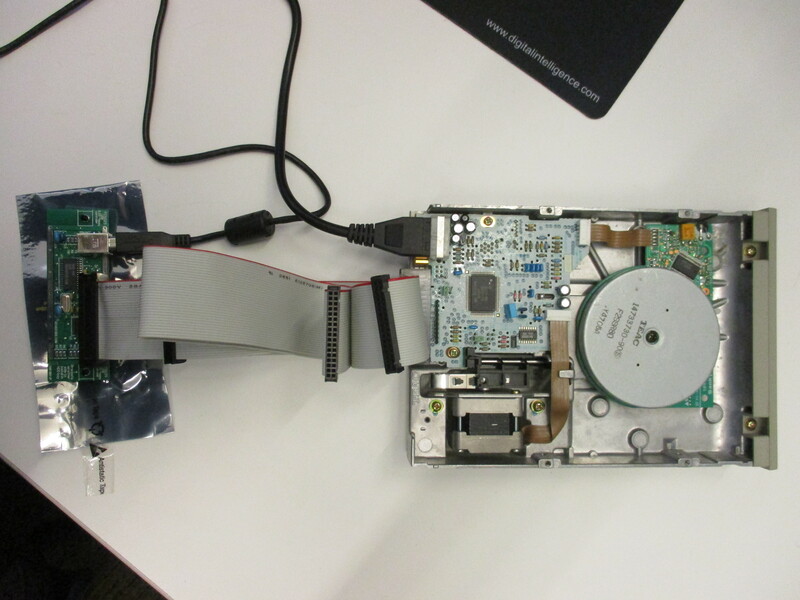 We decided on purchasing a 5.25″ floppy disk drive of off Amazon and a FC5025 controller. 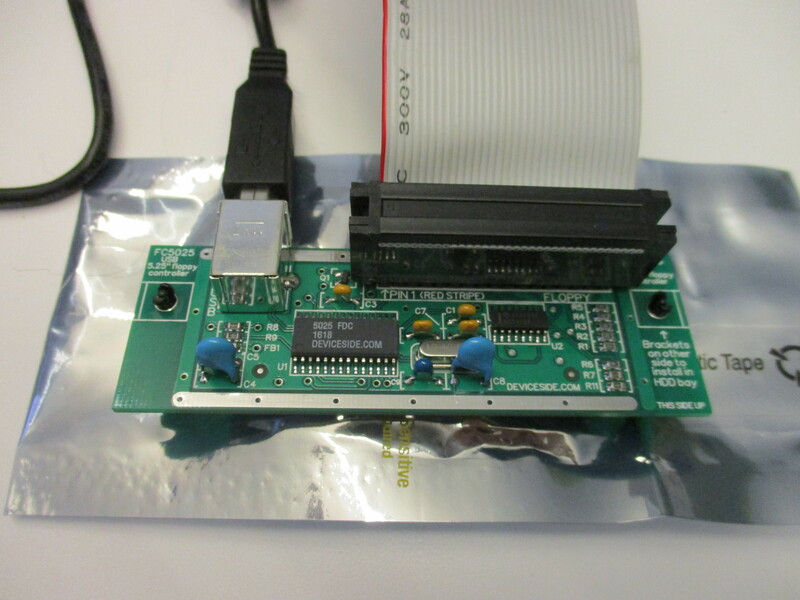 The FC5025 controller is essentially a circuit board that liaises between your legacy 5.25″ floppy drive and a modern computer running a contemporary operating system. These two components are the essential building blocks to getting data off of 5.25″ floppy through disk imaging because they interface between an older, circa-1981 floppy disk drive and a modern computer. 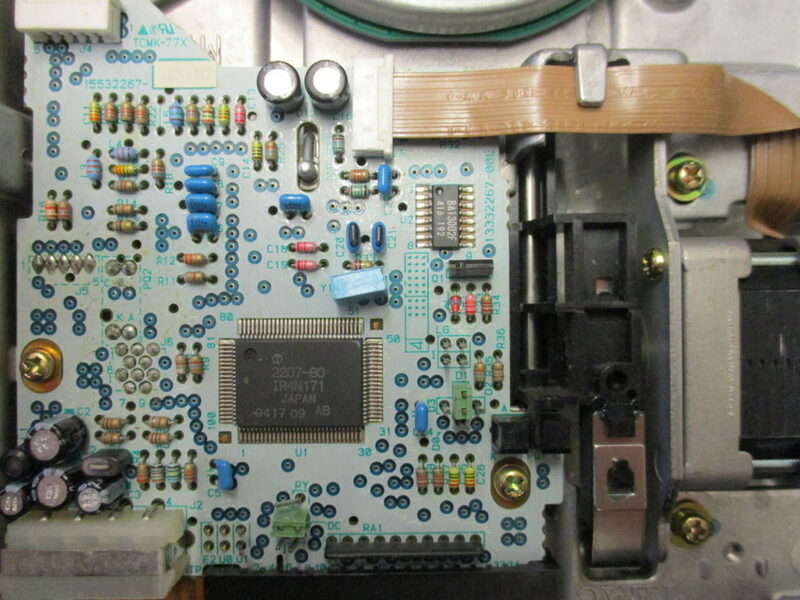 Maryland Institute for Technology in the Humanities’ (MITH) Vintage Computer site does an excellent job of breaking down the FC5025’s connections and instructions for imaging floppies. The card comes with drivers to enable connections to Windows (98, 7, 8, XP), Mac (OS X), and Linux operating systems. These pieces of hardware will grant the WCS Archives access to the 5.25″ floppy disks in their collection. 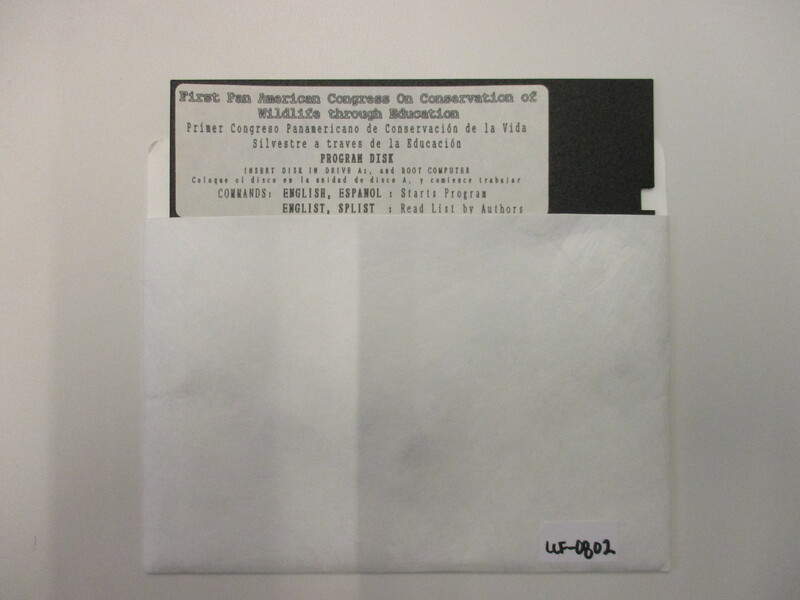 The disks date back to the early 1990s and will also allow researchers access to that data, and the documents and files contained therein. We were excited and geared to go to hook up our components and test how they would react with our current forensic environment (an Ubuntu Linux BitCurator Virtual Machine hosted on our 64-bit Windows 10 FRED). If this sounds like a laundry list of inconsequential gibberish, it isn’t. One of the strongest lessons I learned during grad school was the value of getting acquainted with your hardware and software components before taking on a conservation or preservation measure. Also, always document your actions, which made the deadline of this blog post an advantageous opportunity for a progress report. One thing we had to consider in this particular setup was the floppy disk drive’s jumper configuration. A jumper is an electrical conductor that can guide, bypass, or close an electronic circuit on a printed circuit board, such as the FC5025. A jumper usually comes in pairs and can be open or closed. A closed jumper will have a jumper shunt over its pins and an open one will not have a jumper shunt over the pins. Pretty simple, right? Our drive’s E2 jumper was open and I didn’t want to apply a jumper shunt on it before confirming that setting would not introduce any errors on our setup. So after raiding forum after forum and opening the question out on twitter, the answer was right under my nose. After cross-checking with FC5025’s manual, I was able to confirm that although E2 closed was the preferred setting, the drive was still able to perform with E2 open. That detour, however, led me to come across the TEAC drive’s specification sheet, which includes valuable information on how it works plus ideal handling conditions for the drive. Also, a reminder to read the entire installation manual thoroughly before beginning installation. To install the FC5025 imaging software on our BitCurator virtual machine, an Ubuntu Linux forensics environment, we needed to compile the software. In theory, this is a fairly straightforward process for which one may find many tutorials and step by step guides on the web (thank Cthulhu for Ubuntu forums and StackExchange!). Unfortunately, while the latest version of FC5025’s imaging software has been updated to support Windows 8 usage, here at WCS, we are using a Windows 10 host machine. Moreover, FC5025 official support for Ubuntu only goes up to 11.10, while here we are currently using the 16.04.01 version. Luckily, Device Side Data’s (DSD) customer service helped along the way with step by step instructions. During our back and forth, the DSD representative guided me through installing the necessary development libraries, including libusb, an open-source C library that gives applications access to USB devices on various operating systems. In the end, the solution involved using the “make clean; make” command on the command line, the command erases all files associated with previous invocations of the make command and actuates a new, “clean” install of the program. The FC5025 up close and personal. While waiting for Device Side Data to get back to me and to quell my paranoia by confirming that all the components were working correctly, I took hold of our WCS work laptop, which is running Windows 7 (which might as well be considered legacy software as well), to install the disk imaging software there and test the card and drive. We were able to get our setup up and running both on our FRED and on my work laptop, and disk image four disks before the day was over. In spite of our small victory, most of the disks we imaged had multiple errors during imaging; also, while attempting to browse the disks, we discovered that all of them were unable to show a file listing. So, some work and refining of our workflow lies ahead. the computer that created these disks is still in the library. It works fine + can both read these + convert them to smaller floppies. 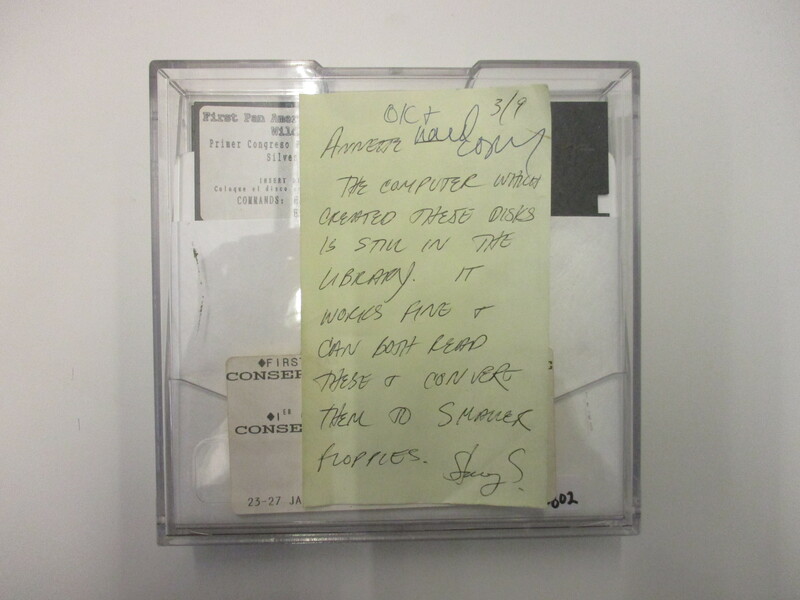 I love coming across notes like these during my work, because it emphasizes archival labor’s inherent common sense. Stacy might have thought, “my media is becoming obsolete, but we need access to our files to continue our work”, so let’s “copy our files to newer media storage. Problem solved!” Perhaps without knowing it, Stacy was looking out for her data back then by transferring it to a non-obsolete media format, and implementing a media migration strategy and plan! Can’t wait to continue to push forward and find out what is on these enigmatic disks! This post highlights work that is being completed as part of our Legacy Digital Removable Media Project, which has been generously funded by the Leon Levy Foundation. For more about the project, please see this October 2016 post. What a delightful journey! Keep at it! 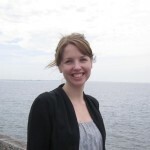 Thanks Scott–we’re enjoying seeing what Caroline comes up with as well! Thank you for sharing about your set-up process! I’m trying to get our 5.25 drive going with the Device Side Data controller, but unsure how to move forward on powering the drive. Can you tell me more about the power supply you’re using? Let us know how you move forward! We have had this device for a while now and running on legacy windows 98 quite nicely. We recently had some Mac floppies and were able to get the data off them by simply using the browse disc option and saving to a folder on the PC without making any images at all. The files were just word processor documents so that was all we needed in this case. We have recently acquired an Amstrad 3″ floppy drive and connected that to the controller. The Amstrad floppies are CP/M. The DSD controller looked at the floppies but could not get much intelligible info from them whilst running any of the CP/M modes available with the supplied software. We have since made contact with DSD and requested support for Amstrad 3″ floppies but sadly the response was “perhaps sometime in the future”. We will now be looking at Kyroflux which is known to support Amstrad disks. Good luck with the Kyroflux request! We are happy to share any documentation we have about our use of it. Have you put the controller card into some kind of case or enclosure? I’ve been trying to find some way to use it so that it would be protected, but I haven’t found any solutions (particularly since they don’t sell their own custom enclosure anymore). Hi, we have not tried to do this yet, but we’ll let you know if we do and find any solutions. http://www.deviceside.com will not ship tp europe. Someone has an spare one in the meatime? I’m afraid that we don’t, but maybe someone else will see this who does!